After a brief hearing Tuesday, a Denver district court judge placed a Republican state house candidate on Colorado’s November ballot. The judge ordered Secretary of State Wayne Williams to add the Alamosa Republican to the ballot after the candidate and party officials missed a series of deadlines for filing information required of all state office seekers. The ruling is being appealed to the Colorado Supreme Court. Denver District Court Judge Ross Buchanan ruled that despite the weeks-late filing of multiple forms, Alamosa rancher Scott Honeycutt and the Colorado Republican Party “substantially complied” with state election law. In its June 25 lawsuit seeking ballot access for Honeycutt, the Colorado GOP didn’t argue that Williams’ office did anything wrong by keeping the rancher off the primary ballot. Instead, the party acknowledged that a series of mistakes by party staff and officials prevented Honeycutt from appearing on the primary ballot in the race for House District 62. The party and potential candidate convinced the judge to forgive the administrative errors and order Secretary Williams to put Honeycutt on the general ballot. The Colorado Democratic party intervened in the case, opposing the GOP request on the basis that there was no Republican primary election for House District 62 and that it is simply too late to add a candidate to the general ballot. The Democrats are appealing the judge’s ruling to the Colorado Supreme Court. A lawsuit was required because neither Honeycutt nor party officials filed the required candidate paperwork until nearly a month after the deadline, resulting in Honeycutt missing the ballot. In their petition filed the day before the primary election, Honeycutt’s attorneys argued that the failure to turn in required documents lies solely with a volunteer District Committee chair who had only been in the position for approximately two weeks. The lawsuit acknowledged that chair Larry Heersink did not ensure that Honeycutt complete the required Candidate Acceptance form. It also asserts that Heersink completed the other required form, but that he failed to submit it to the secretary of staet, instead mailing it to the Colorado Republican Committee (CRC) without keeping a copy. The CRC, however, never received the document Heersink claims to have mailed. Heersink’s inexperience as committee chair was the result of his last-minute replacement of previous chair, David Broyles, who resigned ten days earlier. Broyles resigned after generating outrage when he posted “Republicans hate poor people” on the Alamosa GOP Facebook page. Ten days after the deadline for the forms to have been submitted, the secretary of state’s office had not received the required forms for the Republican candidate for House District 62 and so it finalized the primary ballot with only the Democratic candidate listed. The Colorado GOP party acknowledges that the missed deadlines are soley its responsibility and says it will do a better job next time. As reported by the Colorado Times Recorder previously, Honeycutt says he was assured State Elections Director Judd Choate that he would be on the ballot. At the time, the secretary of state’s office refused to comment on the matter other than to say that its attorneys were looking into it. Asked after the hearing when and if the secretary of state discussed the possibility of filing a lawsuit with the state Republican party, Deputy SOS Suzanne Staiert said that the office indeed discussed the option around the middle of May. 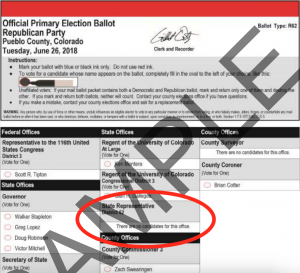 Colorado Republican Party spokesman Daniel Cole declined to comment on why it took until June 25, the very last day before the primary election, to file the petition with the court. At yesterday’s hearing, attorneys for the secretary of state agreed with the party that it didn’t do anything wrong and that it was simply following the rules and deadlines of Colorado election law. However, they also told the judge that should he rule that the candidate had substantially complied with the law, the secretary of state would not oppose the state party’s request to place Honeycutt directly on the ballot. This article was first published by the Colorado Times Recorder. And if candidates get this many chances for "do overs" during an election cycle, shouldn't primary voters whose efforts were invalidated by returning both ballots get some relief, too?